Ocean Front, Luxurious, immaculate with 2 large king suites Condo. Two Master suites with king size beds or convert to 2 twins 2 bathrooms. A beautifully decorated, non smoking, privately owned large condo located right on the beach in the south beach area of Puerto Vallarta. Gorgeous views of the Banderas Bay and city. Watch the whales at play from the balcony that leads off the master bedroom and living room: A paradise to come home to after a busy day in the town, located 7 minutes from the city. Fully air conditioned, tiled floors, granite counter tops, high speed wireless Internet, 47 inch flatscreen T.V.. with Sky satellite providing 2 U.S. stations, stereo, DVD washer and dryer in unit and a fully equipped kitchen , granite counters, with full size dishwasher, microwave, frig /freezer, B.B.Q. on balcony etc and much more. Snorkel right in front of the condo, body surf the waves, relax by the large pool which exits directly on to the almost vendor free beach. 24 hour gated security, elevator, handicap ramp, bi-lingual reception and maid service once weekly on Tuesdays for 3-4 hour. Our internet and T.V. can be a bit "sketchy" at times, we are on the Oceanside and surrounded by the mountains on the opposite side. Guest Book. : Most of our guests write down their experiences in the book, you would do well to follow their suggestions, we have experienced many positive events doing this. There are many brochures and guide books in the condo for you to use, if you are a first time visitor let me know and I will send some to you so that you will be familiar with what to expect before you get there. Puerto Vallarta stands as a destination that offers a lot more than sun and surf. Arts and culture, one of the highest indexes of galleries per capita in North America, film festivals are held several times a year. off road Adventures, dune buggy ,ATV Jeep. South end of town. : Often overlooked because we are just outside of the 'the noise and bustle', on one side is the Bay Of Banderas, and the other is still the jungle which hopefully will remain and not become 'cement city' like so much of the hillside has, we have this wonderful location, further South one has the Zoo at Mismaloya, Botanical gardens, Chicos Paradise, Tequila tasting factory, and of course the beach at Mismaloya where you can rent pretty much anything that goes on water, hire tour leaders or boat captains for deep sea fishing, all of this and much more. A bus ride North or about three miles you can enjoy the bountiful night life, art galleries, more beaches, the Malecon for a wonderful promenade walk and many other attractions before returning to the serenity of the condo. I am from England, married to a German, love Animals and baby anything, not snakes.I was a Pan American Flight attendant, prior to that a Neo Natal nurse at the Royal Free Hospital in London. Lived in Guatemala for two years before coming to the States, retired from flying when Pan American went Bankrupt. We have two grown children, Heidi and Husband Mark. Son Hans 'Nick',once bitten twice shy but gradually moving forward.I have a gorgeous Golden Retriever and a beautitiful pug, only a mother can see beautiful so I look at his face and see my beautiful boy so obviously I am an animal lover.Our summer home was Seattle, our full time home is now Arizona but in the summer we head to the mountains in Arizona. . We have had the condo many years and love our little piece of paradise. We love Puerto Vallarta and have been going there for 20 years, love the people and the way families take care of each other, have made many friends over the years. Why this property, what is not to love, it is priceless, the people are so friendly, we have made wonderful friends, that is why, I can't imagine not having this beautiful ocean and beach to see every morning, to see the sea life and listen to the waves as it sends me to sleep, more to the point, why not this property? We do prefer long term renters 2-4 months so all of you frozen Canadians can leave the white stuff behind. I have many references and reviews, also awards for excellence. Puerto Vallarta is the only place where we truly relax, are sincerely welcomed, so it is our home away from home. We feel safe, people young and old, always caring and ready to help you. It is a beautiful world here, forget the media melodrama, in the states we have more problems in one day than I have seen here in 20 years. When there are a few days open in HI Season I often have a special, so please e mail or call, especially April. Just please don't insult me, we offer you a gorgeous condo , on the beach, accommodates 4 in Luxury. It is not a hotel and neither motel 6 or 8 that offers you nothing. Call me for special rates if there is a short block of time or a long period of time open. Canadians who want to block 3-4 months need to call or write a year ahead, the time you want is the time everyone wants. I can assure you that you will have everything you need and if it is a long booking a little less cost. Master Bathroom is fully furnished with towels, beach towels, shower jell, shampoo soap and hairdryer, Guest bathroom has walk in shower sink and toilet. Master bathroom has a beautiful large walk in shower and was newly renovated October 2010 Both bathrooms newly renovated with new sink and new floor tiles. Best Beach in Puerto Vallarta. Not just near but almost in it!!! from your balcony see the whales at play in season, see the downtown city lights, watch the cruise ships as they pass to go to Marina, or just sit back margarita in hand and feel yourself in Paradise. Beautiful Bay of Banderas, gorgeous beach , great pool, awesome condo, what more could you want. Surrounded by the lush Sierra Madre Mountains, they offer protection for the storms in the off season. The best beach in P.V.,golden sands and almost private, crystal clear water, this is priceless as a guest recently said. Water is everywhere, nowhere like here, we have it all. Huge sandy beach, away from the overcrowded beaches but close enough to be downtown in minutes. 7 pesos on the bus . Private line, not shared with the building. Building enters at 5th level, elevators from 1st to 9th level.Below level 5 no cross breeze, above 5,cross breeze and less noise. Everything you need for a full course dinner and guests, plenty of dishes and cutlery. Pots pans and all small appliances.It is not the maids job to clean the dishes or B.B.Q. Beautiful large dining table , seats 6. Hi Chairs and cribs can be rented for a nominal fee. Can't finish the book, take it with you, you are welcome. 4 miles South at Mismaloya one can rent Kayak, canoes, book tours, have lunch, much fun to be had. Large pool deck with tables and chairs. We are totally accessible. from the parking lot there is a ramp to the lobby and from the lobby 2 elevators, however, from the 1st floor there is a flight of stairs with handrails to the pool and deck.also an electric chair. Steps into the pool also have handrails each side. We loved our stay at Dolce Vida. The condo is adorable, clean and on the ocean. What more could you want? There is a taxi stand and bus stop across the street so we were able to conveniently get around the city for all of our activities. The doorman was polite and helpful. Diane responded to my questions quickly while we were there. We would definitely return! Thank you Diane! Relaxing and beautiful beach, great pool area and very well appointed condo. Thank you for the review, it was a pleasure to have you stay. Beautiful well equipped condo. Property is very nice and well kept. I'm not really a kids person so at times very noisey around the pool. I was at this property when hurricane WILMA hit, no damage, no power interruptions, but due to it raining for almost 4 days and no sun the pool was very, very, very cold. Always a few problems when you're at any location if owners and renters don't follow the rules but my over all experience was excellent. I appreciate all reviews and thank you for this one as it tells me you were very happy with the condo, hopefully if you come again, no hurricane and better behaved parents!!!. You are so welcome back Paul. Incredible location, comfortable condo, highly recommend! We loved our time in Puerto Vallarta! The condo was a perfect haven for us. We had 4 adults and a one year old baby. When we first arrived, there were a few issues with the AC, but we worked with Diane and she took care of it very quickly for us. Both rooms were very comfortable and even more spacious than we were expecting. The condo is in incredible condition and Diane has done a wonderful job to make it feel like home, while giving it a fun mexican vibe. We made breakfast in the condo and ate out for all other meals. The condo had all the pans/utensils we needed for the meals we made. It was nice to have a refrigerator and washer/dryer. For transportation, we mainly used Uber. We found that Uber was sometimes 50% (or more) cheaper than taking a taxi. Uber is also much safer and the cars are more comfortable than taxis. We also used the bus in front of the house a few times. An Uber from the condo to the Malecon was about 80 pesos. A taxi wanted to charge me 150 pesos for the same trip. The bus is 8 pesos and takes you a few blocks away from the Malecon. The pool was very nice and convenient. The beach was always very calm and the water is very warm. We loved the service of the staff at the condo. Jesus and Diana were very helpful and friendly. Our favorite place to eat was "La Angosta Feliz". Mathew and family are welcome back anytime, lovely people to communicate and work with, things always seem to happen on a weekend when it is difficult to fix, but fix we did. Thank you for being such great guests, for loving the condo, and the location and telling others about UBER, I was not aware it existed there, our little spot of paradise is so very precious, I love it when you do also. Thank you for the great review, truly appreciate all you said. This was our first time staying in this condo unit and we would highly recommend it! 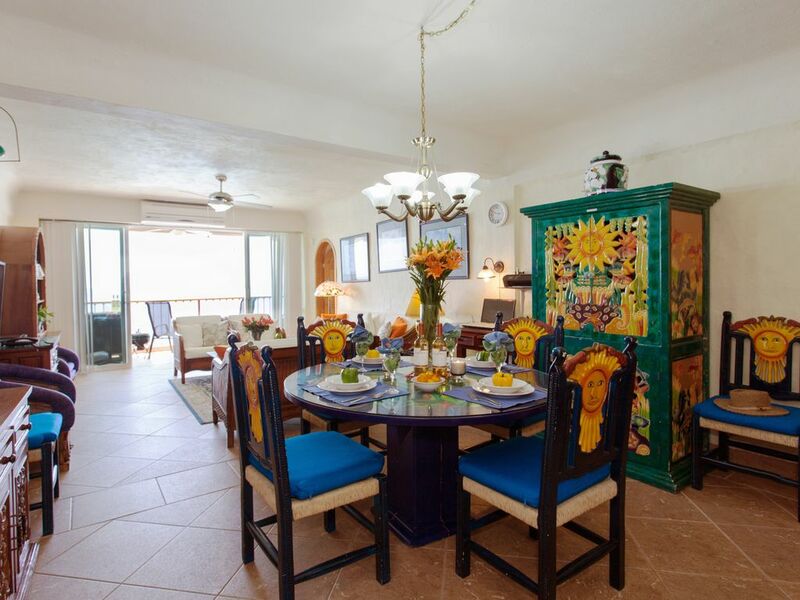 It is comfortably equipped with a fun Mexican flair. The location is quiet and offers a beautiful view right onto the ocean. The first floor of the building leads to a spacious pool area and onto a great beach (the water is amazing!) with almost no vendors. The condo is located close enough to town, which is a short bus/taxi ride away (both can be found directly across the road from the building) and is far enough away from the hustle and bustle to remain a quiet, relaxing spot. The owner Dianne and manager are quick to respond to and address any issues that might come up and the building staff are always helpful and courteous. The only damper on our stay was extremely poor internet connection (don't plan to work while on vacation:-), we ended up going to the pool area or to the top floor for a couple of hours during the evening to find decent connection.. otherwise we had a lovely vacation experience! We would love to come back there again. Thank you so much for writing a review, you were great guests and I look forward to your return. In the rainy season the internet can be awkward but the good news is we are on the list for optic cable soon. I am so happy you had a great time and enjoyed everything you did, it takes many holidays to do everything, so I look forward to your return. Thank you so much for choosing my condo. This is our favourite stay in Puerto Vallarta! The condo is beautiful, comfortable, just like home! Far away from the hustle and bustle of the Old Town, but close eznough to amazing restaurants and nightlife. Beautiful beach and great pool with lots of room for relaxation! Thanks again Diane and Nick for an Amazing Stay! It makes me feel good when my guests feel happy with what I offer, I have no influence over what they say so future guests can be sure that what they read must be true, all I ask that if you find anything to be wrong , call me on the first day so that we can correct it right away. Each time I go I change batteries light bulbs and many other items that normally would last over a year but being on the ocean front changes that, sometimes a battery or light bulb does go out, please check that before thinking it's broken, replacements are there. Most important, Have a wonderful relaxing time, take in all that Puerto Vallarta has to offer, enjoy the warmth of the Mexican People, make friends and come back, remember this is Mexico, Not U.S.A or Canada, you are a guest here. The condo is ideally situated, close to the center of town but far enough away to get peace and relax at the end of the day. The Malecon Or Promenade is full of activity, especially on weekends, you will see all kinds of entertainment from bands, folkloric dance, music entertainers, cultural events, you will feel the warmth and friendliness of the Mexican people and enjoy the incredible closeness of the family togetherness that they project, there are many tourist attractions and tours but the night life on the 'Malecon' is there for your pleasure and shouldn't be overlooked. Just walking along this beautiful stretch of ocean front is a vacationers delight. Please check availability calendar before applying. Other Activities: Waterpark-deep sea fishing-tour surrounding historical areas-art is in abundance for the art lovers. Walk the Beautiful Malecon.Go to the local theatre, Act 11 Stages, Basillio Badillo at insurgents above WINGS ARMY, Zona Romantica, Theatre and Cabaret call 322-2221512. Seats 100 but every seat is a good one, performers are great.. If you need dental work, your savings will cover the cost of your entire vacation including condo and air, as long as you book for 2 weeks or more. My dentist, perfect English, trained in the States and is wonderful, very booked, I would set this up for you after a reservation, basic work like fillings and cleanings is just a day but caps, crowns,bridges etc need more time, the savings are huge. I see I should write 3500 more words, there is just so much one could write about, 2000 restaurants , a beautiful promenade, folkloric performances, art walks every Wednesday evening. I also send you an activity list from my own experiences, we all are different, but this offers each and everyone of us something, Zoomba and yoga in the centre park every day, private Spanish lessons, whatever you want, you can get. Just enjoy yourself and be happy. Long term bookings of 2 or more months will get a discount of $275 per month.Summer rates are often discounted, please call to find out what specials are being offered, 50% of the rent is required at booking, the balance to be paid 60 days prior to occupancy. Christmas period from Dec 23-Jan 2nd $200 per night.7 night minimum. Payment by check, Visa, Mastercard, money order or PayPal, direct bank deposit in U.S. Funds. A cleaning fee of $50.00 is extra If a 5th person is allowed their is an inflatable mattress, the charge for the extra person is 20.00 a day, permission must be given for the 5th person as it is advertised for sleeps 2-4- People.